Mention the name Jose Luis ‘Chele’ Gonzalez and, chances are, the first thing that will come to mind is the wonderfully curated and prepared anthropological cuisine that has become his stock in trade at Gallery VASK in Bonifacio Global City. Gonzalez’s dishes combine local ingredients with impeccable technique—a quality that reflects the chef’s training with some of the world’s masters of gastronomy, an elite roster that includes the legendary father-daughter team of Juan Mari Arzak and Elena Arzak Espina. It is, thus, not surprising that Gallery VASK was hailed among Asia’s 50 Best Restaurants for two years in a row, placing 39th in 2016 and 35th in 2017. But this also begs the question: where does a genius of Gonzalez’s calibre go from here? For that, you have to look towards the Queen City of the South where Enye by Chele Gonzalez serves up exquisite Spanish flavours as the sun goes down. Located at the Crimson Resort and Spa-Mactan in Cebu, Enye takes its name from the letter ‘ñ’ which appears in both the Spanish and Filipino alphabets—a lingering symbol of the impact Spanish colonisation has had on local culture and tradition. Here, diners can see a different side of Gonzalez: one that plays up his own culinary heritage from Spain. Indeed, the space occupied by the restaurant can best be described as comfortable and convivial. The main dining area is wide and spacious with magnificent views of the resort down below; it doubles as an excellent observation deck for lovely coastal sunsets and, on special occasions, glittering fireworks lighting up the night sky. The interiors have a pronounced masculine feel: wood and stone are the dominant materials, while the exposed beams of the high ceiling call to mind a hunter’s cabin. But it is far from being intimidating thanks to numerous design accents that add a merry, whimsical touch: there are black pigs—possibly a visual play on the famed, black-skinned Ibérico pigs that are turned into jamón Ibérico—in the décor: heavy paperweights at each table, cast-iron doorstops out front, and a ceramic sculpture that greets guests at the door. Star-like lighting installations on the walls as well as soft, ambient lighting also add cosy warmth. The in-house wine storage and charcuterie rooms are glass-walled, giving diners a clear look at what goes into their meals; likewise, the open kitchen where Gonzalez’s chef de cuisine Ivan Saiz Sordo holds sway adds further visual interest. 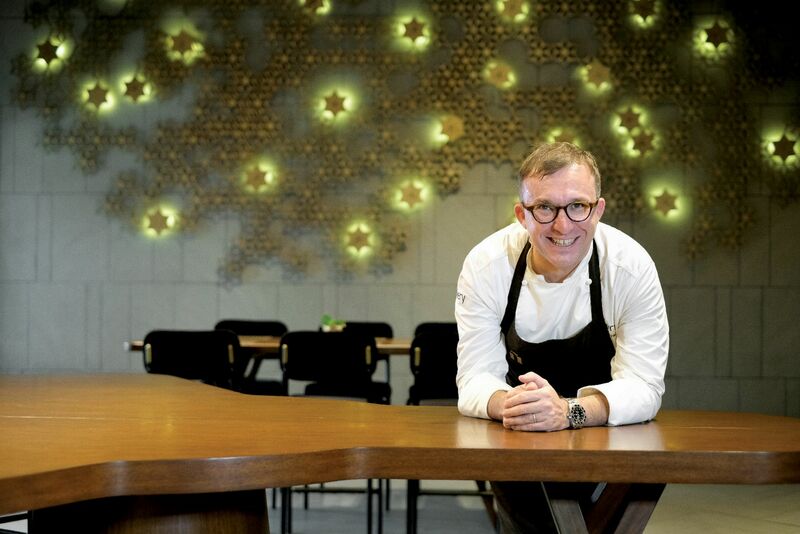 Who is T.Dining's Most Inventive Chef? For all the modernity of the restaurant’s interiors, the menu at Enye reads like a litany of traditional classics from the Iberian motherland. One may choose to begin a meal with a fine selection of pintxos, deep-fried frituras, or plates of jamón Ibérico y Serrano. The croquetas jamón y pollo, crisp on the outside and the interior creamy and savoury, are always a good choice, but diners seeking an unusual and robust beginning should consider the txangurro: a hearty crabmeat mousse roasted in the shell and served with thin, crisp slices of toast. Gonzalez’s take on the classic gambas al ajillo should not be missed, as well, as the prawns are sweet and meaty and play well with the piquant flavours of garlic and chili; one may even be tempted to sop up the leftover garlic-infused oil with some bread. Enye’s main courses all play on tradition, what with staples such as txuleton (chuleton: grilled rib-eye with confit potatoes), caldereta de cordero (lamb stew), along with paella Valenciana and paella negra on the menu. As an edible tribute to one of Cebu’s most iconic specialities, Gonzalez offers lechón Cebu tacos where tender, succulent roast pork is given the Fil-Mex treatment: served on warm tortillas and garnished with a tangy salsa made with local mangoes, a jalapeño-spiked black bean mousse, and a dab of sour cream. But Gonzalez offers something more at Enye: a taste of his northern Spanish childhood by way of the arroz con bogavante. Essentially a paella made by cooking rice in lobster broth, this dish is a speciality in the Spanish province of Valencia. "It is usually eaten in winter," Gonzalez explains. "It keeps people warm and filled up, giving them energy for their daily tasks." The dish's texture alone is a giveaway as to which season it is usually served in: unlike a more familiar paella which is served dry, arroz con bogavante is soupy—more like a risotto but without the cream— and gives the impression of being somewhat heavier thanks to the addition of tomatoes, pimenton rojo (smoked paprika), chunks of lobster meat, and a good splash of cognac. One may choose to order a refreshing organic Chardonnay to cut through the hearty richness of the dish. The heartiness of the food might make diners think of passing on dessert, but a meal at Enye would not be complete without sharing a platter of texturas de calamansi. In this dish, calamansi limes are added to three of the components: in the cake that forms its base, lime-green mousse, and the quenelle of ice cream on top. Finished with a scattering of crushed biscuit crumbs, it is a play of sweet, sour, crisp, and creamy in the mouth; definitely a charmed end to a wonderful meal. With its winning formula of excellent food served in a convivial space, it is not surprising that Enye by Chele Gonzalez made it to the list of Philippine Tatler’s top 20 restaurants of 2018 and was also hailed Best New Restaurant of the Year. And this, in and of itself, is enough to make one wonder: what will Chele Gonzalez be up to next? We can’t wait to find out.